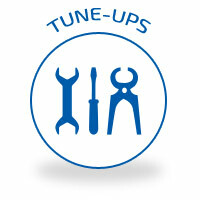 A “tune-up” involves a variety of services for your vehicle and is an important part of your preventative maintenance plan. Our certified technicians will replace, repair, flush, or top-off components to keep your vehicle running at its best. From spark plugs to fluids, our certified technicians keep track of the various services recommended by your manufacturer so you don’t have to. We’ll keep you aware of the maintenance services and milestones you need to know to take care of your vehicle. Changing spark plugs and wires are important to avoid performance issues. But not all spark plugs are the same – your vehicle will require a specific kind to meet the specifications of the car maker. While a “tune-up” is a dated term, these services are still important for your vehicle. Stop by our Alabaster, AL repair shop or call the expert technicians at Melton Automotive to learn about the best maintenance services for your vehicle. From inspections to spark plugs to fluids and more, Melton Automotive is here for all your vehicle maintenance needs: 205.663.6088.